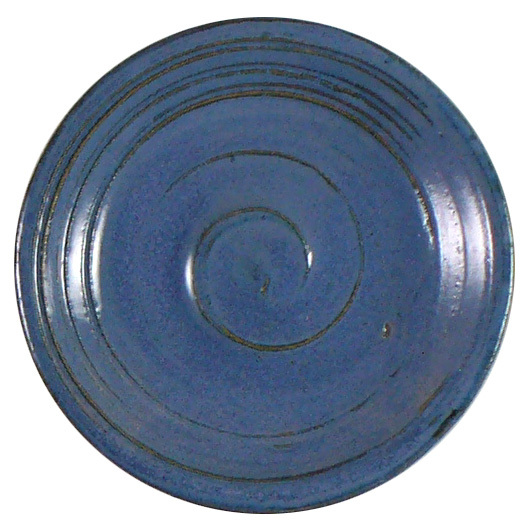 This produces a variegated light medium blue glaze that breaks greenish over edges. This glaze is very consistent and has very good working properties. 5% titanium dioxide, 1% cobalt oxide, 1% copper oxide and 0.5% iron oxide: A light glossy blue glaze with some lighter variegations, breaks to a green over the edges. 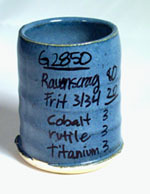 3% Cobalt Carbonate, 3% Rutile, 3% Titanium dioxide: A variegated light medium blue glaze that breaks greenish over edges. 2% copper oxide and 2.5% titanium dioxide: Does not leach on vinegar test. Produces a celadon green with some crystals growing on the bottom of the bowl where it pools. Normal application. For mixing instructions please set the master recipe, GR6-A.